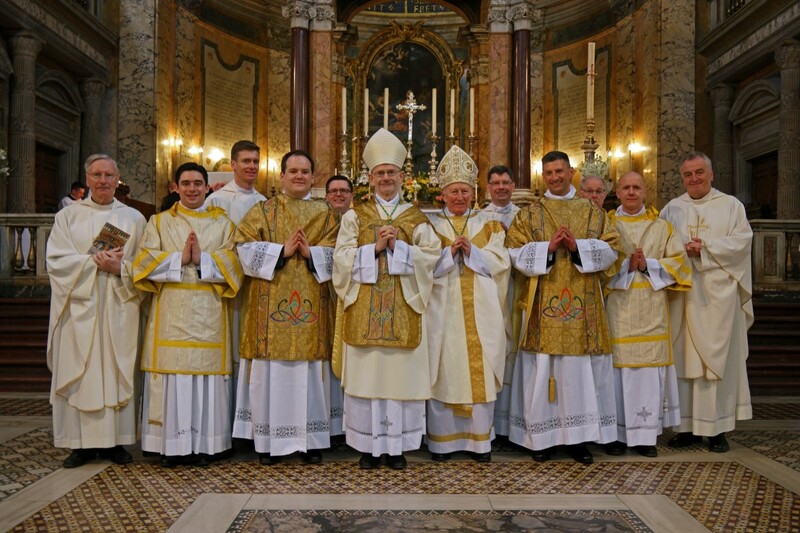 Two seminarians of the Pontifical Irish College, Rome, were ordained deacons on Easter Tuesday by Bishop Alan McGuckian, SJ, at the Basilica of St Prassede in Rome. Rev. Anthony Briody, a former Human Resources Manager, was ordained for Raphoe Diocese, while Rev. Declan McGeehan was ordained for Derry Diocese. Both men are transitional deacons, meaning that they are due to be ordained to the priesthood later. In recent years in Ireland, permanent deacons have also been ordained, so that deacons have become a more familiar presence exercising a unique ministry in the Church. Deacons are ordained to a ministry of service, with a special concern for the poor and those in need. They also carry out various sacramental and liturgical roles in the name of the Church, such as baptising, assisting at the altar and reading the Gospel at Mass, preaching, presiding at certain occasions of prayer and at parts of wedding and funeral liturgies. Family members and friends of the new deacons travelled from Ireland to be present at the ceremony. 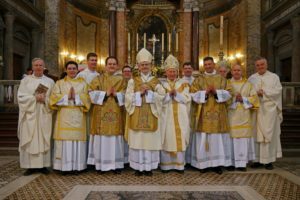 They were joined by seminarians from a number of other seminaries in the city who served the ordination Mass at the Basilica of St Prassede. In his homily for the occasion, and drawing on the Gospel of Easter Tuesday, Bishop McGuckian reminded the two candidates of Mary Magdala’s capacity to follow the Lord even when it seemed as though all was lost. 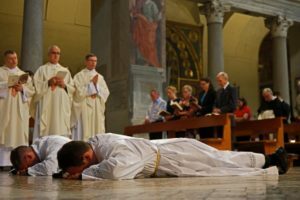 The Bishop exhorted the two new deacons to live a lifelong commitment to diaconal service especially after ordination as priests.